Time travel makes it cheaper. Or something equally stupid. A coworker just forwarded me a blind email from someone who, if he’s the same guy I found on LinkedIn, is a Chief Marketing Officer for a variety of Dallas businesses. 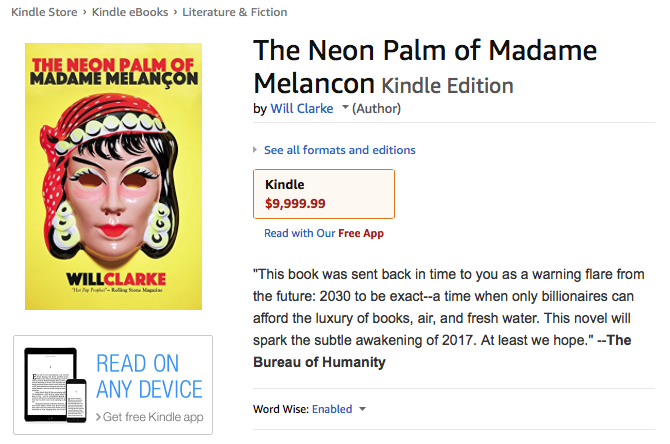 If so, I’m hoping the misspelled and poorly capitalized missive (“Will Clark (dallasite) third book is on pre-sale in electronic format for $9999.99 on Amazon because it has been transported from the future where reading is a billionaire’s luxury. It will be available in August in Hardcover for the rest of us with 2017 pricing.”) was a purposeful ruse to not seem like a press release. If so, he did in fact succeed in making me look. But the reason I am posting anything at all is that my search led me to this timeless Tim Rogers nugget of a rant about the aforementioned Will Clarke (with an “e”). Happy Friday.